Synopsis: In a turn-of-the century England steeped in steampunk and magic, sixteen year-old Christine Daniel learns her life-threatening illness stems from her paranormal visions. During the London Season, Allie, her beloved sister and the family heir, seeks a noble match while she searches the occult underground for answers. But the only witch who can help will not do so unless Allie marries her beau, an impoverished aristocrat, so that the illicit pair can share Allie's wealth. 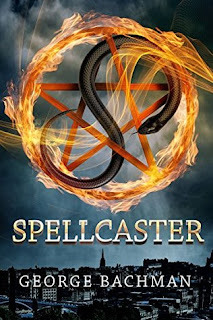 Review: A beautiful blend of the fantasy and historical genres, Spellcaster is an amazing adventure leading you through a new version of Victorian England. With magic and aristocratic sensibilities at odds, Christine must skillfully navigate her way through drawing rooms and seedy fortune tellers alike. Don't miss this excellently written adventure! About the Author: George Bachman lives and works in New York City.